Saving a beautiful quote from an eBook is easy with click.to Simplenote: just highlight it in the text, copy it with (Ctrl+C or right click -> copy) and select click.to Simplenote from the menu. 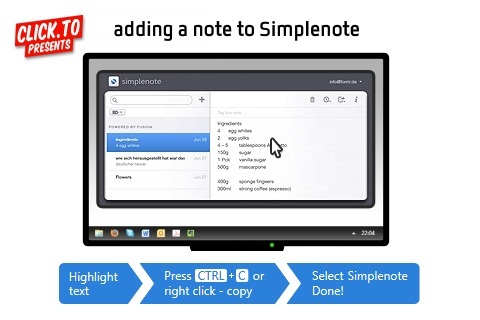 You’ve now, very easily, created a simple note with your selected passage. The note is automatically saved online and can be shared at anytime with friends, family and colleagues.